The frame clamp can achieve 2cm height adjustment according to the substrates height .the platen can move 10cm front and back All the frame clamps can achieve the best up-down tension by adjusting the spring tension according to the frames weight There are metal positioning wheel,positioning groove and positioning steel sheet.To make sure the overprinting accurate All the machines adopt advanced electrostatic spraying .the parts adopt stainless steel aluminium ,nickel platingand galvanized process,it is corrosion resistant and no rust. 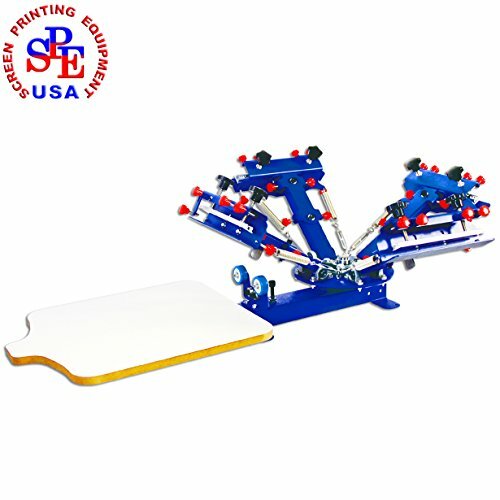 This machine is four color screen printing machine,suitable for one operator. The operator just need to stand in one station to work,the platen and frame can rotate in 360 degree,the operator don't need to move. Adjustable double-spring devices are available for screen frames of different weight.Screen clamp can be moved up and down, which is suitable for screen frame within 1.2" (3cm) thickness.